In the ravine below our home leading down to the stream we have built a stone wall snaking through the woods. Its twists and turns were determined by the trees that are there. It starts and stops in locations dictated by a dilapidated old field wall. It extends for over 800 feet and is about 30" high. and it loved the snow! Oh boy does that look pretty. I am weird person that loves the snow, wearing coats, scarves, boots and gloves, playing in snow. Can't even imagine how much work that wall was, will have to read your page to find out where you live. We live in western CO few miles west of Grand Junction. Have lived in MT, KY, Co Springs, Tucson and San Diego. I love MT best. Would love to move back there but hubs says we're too old, hmmmph, ought to speak for himself. We have 2 kids/grandkids here. 2 oldest live in San Diego area. Well your page didn't tell me where you live. Looks like you have some acreage out in country, gorgeous with all the trees. We had 20 acres in MT on big lake. Like no other place have lived. Loved it so much and still miss it so much but no kids there or grand kids. Thank you! We live on 26 acres in rural northeastern Connecticut where rocks are plentiful! 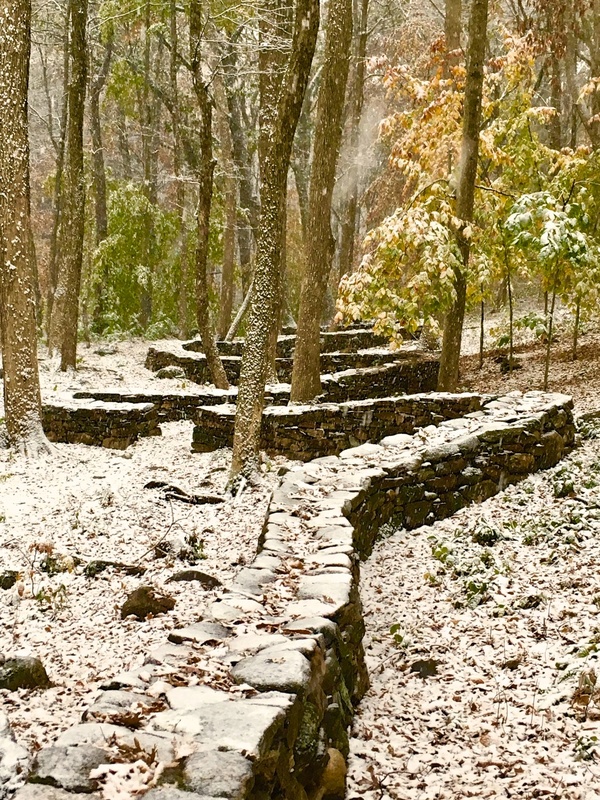 What wonderful photos, the wall looks so pretty with the bit of snow on top. Looks like a lot of work has gone into the wall. It took my husband and me 77 to build!